When you look at a map of Iberia, it seems strange that a small western slice of it should be a separate nation. How did it manage to fend off its larger neighbour? How retain its own distinct language and culture when the other principalities - Aragon, Castile, Andalusia... - amalgamated to become Spain? I sometimes wonder if the rewards of conquest would not have been worth the effort for the new country of Spain because Portugal did not have enough to offer its bigger neighbour. There were after all richer, easier pickings to be had elsewhere. The lack of land borders with other countries certainly made Portugal look outwards, over the seas, for friends and partners. But has that independence come at a price? To find out what this has to do with the children's scrapbook pictured above, click here. Much of Portugal is extraordinarily beautiful. It is a hidden gem almost unknown to those who consider Portugal and the Algarve to be synonyms. In the centre and south, the Alentejo with its rolling grasslands and sparsely planted cork oak groves, is reminiscent of the park-like savannahs and wide-open skies of man's African infancy (though, like the Sahel, this part of Portugal enjoys minimal rainfall and searingly hot summers). The northern part, which is blessed by a temperate climate, is dominated by majestic mountain ranges, some wooded with pine and eucalyptus, others made from exposed granite covered in gorse, broom and heather. Some of these serras are cut through by rivers in fertile valleys and there is indeed a narrow coastal plain. 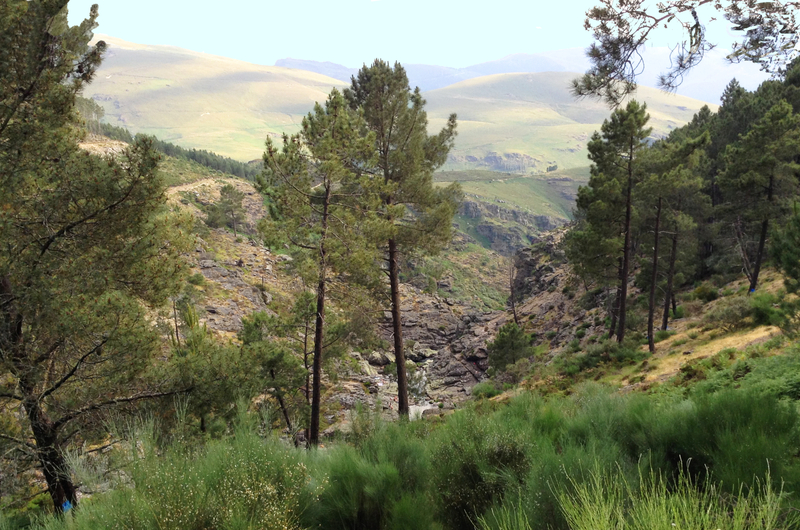 I love these landscapes; the enchanting views, the intimate valleys, the uplifting spareness of the wilderness. Why would a Spanish monarch not lust after these? Perhaps the answer is that beauty is not enough. Portugal's land mass is not easily exploited financially. Kings desire more than beauty. They require treasure: gold and silver for their bank vaults, silks and furs for their clothes. Portugal had few natural resources that the kings of Spain would cast an envious eye upon. Even agriculture, carried out by subsistence farmers on small terraces half way up the mountain sides, produced only enough food to feed the growers. So it seems to me that relative poverty was perhaps both the saving grace and the curse of Portugal: there being no great wealth to be mined and only a little tax to be extracted from the poor, the country contrived to remain proudly independent. Life for the Portuguese however was never easy and, even after the development that membership of the EU has brought, for many people it is still remarkably difficult. Last summer I wrote of the beautiful views from the Serra de Alvão in The Mamils of Mondim. We were then staying in Sernelha, a hamlet high in the mountains, where there were a few posh, new houses, a number of tumbledown old ones and not much else. A shop, café and church were available in nearby Bilhó but no restaurant. We picnicked the first night but on the second I wanted a proper meal though I really didn't want to cook so we decided to investigate a restaurant advertised on a tatty piece of wood where the road divided outside the village. Down the hills we went, through dark, aromatic pine forest leading to a rocky wasteland, past waterfalls, which disappeared into rock strewn gullies, and on to a fertile green valley where a little village boasted a bar with a surprisingly large restaurant behind it. At the far end of the dining room was what you might almost call a mini village museum. We were a bit on the late side but the landlady was happy to serve us and, indeed, not long afterwards a large party speaking a mixture of French and Portuguese followed us in. Goat stew was the dish of the day so we ordered it with a mixed salad and, while we waited, I began to yearn for the for locally grown cherries and peaches displayed on a nearby table. In fact, I was so hungry that to avoid disgracing myself by pinching a couple cherries to stave off the pangs, I went off to look at the artefacts displayed on the back wall. There was a rustic shepherd's cloak made of straw, together with a number of pots and crocks, baskets, walking sticks and hats. Most interesting, though, were the implements used in in spinning and weaving. Dinner came and we tucked in. The stew was delicious and, as so often in Portugal, cooked to a quantity and with the calories to support a couple of labourers who had spent all day tilling the ground with a mattock. We ate far too well and still left a great deal on the serving dish. Before the restaurant owner/manageress came back to see if we wanted dessert I went back to the 'museum' to look at a large scrapbook on a table. Written by pupils of all ages at the local primary school around 25 years ago, it is a touching record of village life as it was then. Do you wonder what people in the countryside used to do, and in many cases still do, throughout the year? Look in this book and you will find out. 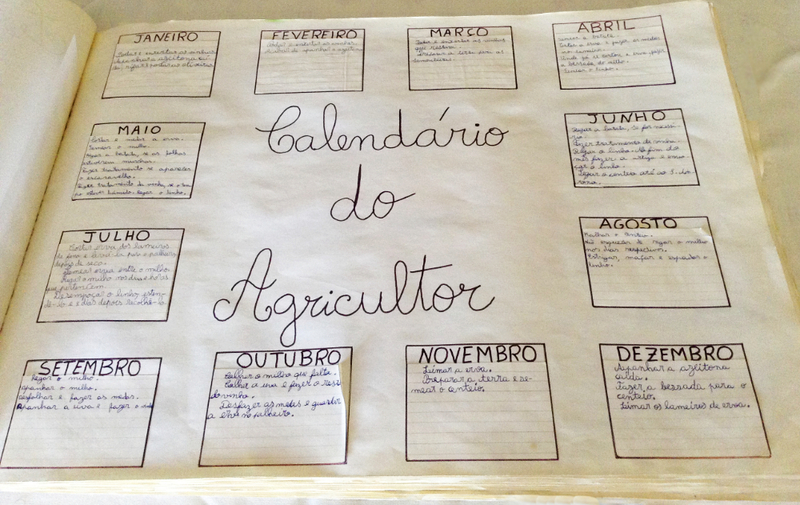 This page shows the farming calendar for a typical year. In January, for example, the farmers picked up the fallen olives and pruned the trees. In March the ground was prepared for sowing crops such as potatoes and linen. Vines were pruned and tended at different times and then in August, flax was cut, softened and beaten to release the linen fibres. September saw numerous crops being harvested and in October the remaining leaves and stalks were collected dried and formed into haystacks. So the year turned until in November and December, the time for planting rye came around and the olives were picked again. 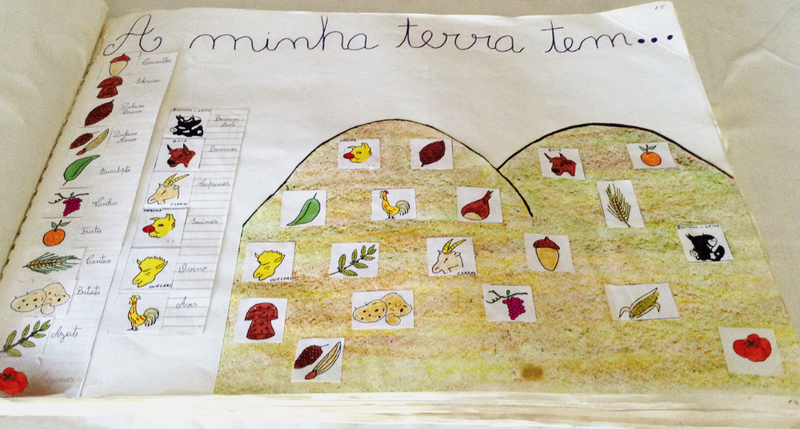 Here in pictures, under the title, "My land has.." are the products of the Serra de Alvão, from oak trees and vines, fruit and vegetables, to chickens, goats, pigs and cattle. Even the possibility of tourism was taken into account: cliffs, waterfalls, spinning and weaving, and cultural activities such as music. I could have looked at this book all afternoon but the restaurant owner was asking about dessert. We ordered those peaches and cherries. Delicious! 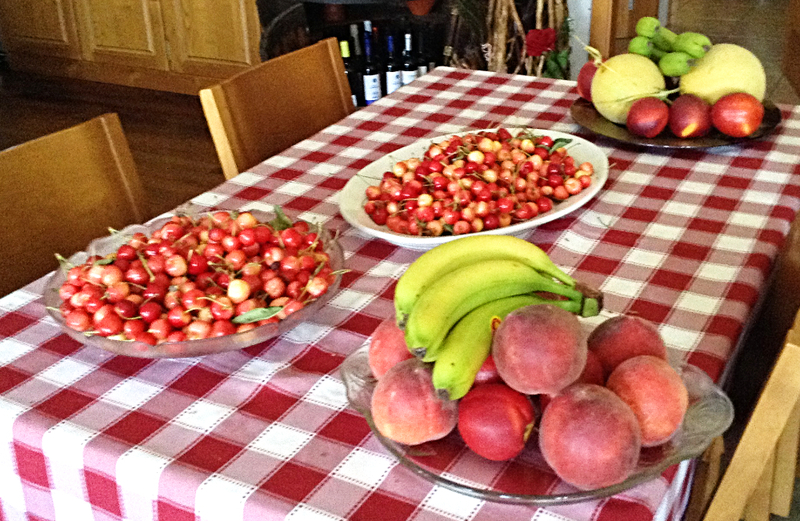 (So delicious that we asked to buy some cherries and - whoopee! - they sold them to us.) We also talked to the restaurant owner about the wonderful scrapbook. Two things stood out. The first was the harshness of a life growing crops on terraced hillsides, a hand to mouth existence where automation isn't possible. The people had few products to sell so what they ate depended on how much land they had and how good they were as farmers. People were shorter when I first visited – at 5 feet 2 inches I was average height – because the scarcity of nourishing food meant that children were stunted. And so to that first photo I showed you. The page is called "The emigrants of my land". "How many people have emigrated from the village?" I asked. I thought I'd misheard but I hadn't. Over the years 90% had gone. First one left and wrote reports of a better life. Others followed and sent back money, which explains the posh houses to be found here and there, and bit by bit much of village left for France and Germany, locking up those fine houses for much of the year. Do you remember the group that came in after us, speaking French and Portuguese? They were emigrants and the sons and daughters of emigrants. They come back in the summer driving French registered Peugeots and Citroens but will that continue indefinitely? I doubt it. As the older generation dies off it will happen less and less. The young ones are already totally French. Why would they consider returning to a harsh subsistence life? Think too of what Portugal has lost. Those who leave are so often the brightest, best educated and most entrepreneurial: just the people Portugal most needs. Little by little too the aspect of the country is changing. Small villages high in the mountains are populated most by the old and infirm. When they die or are persuaded to leave by concerned family the houses deteriorate and the land goes back to grass and scrub. Even lower down the hillsides, the terraces are often grassy rather than cultivated. When we spoke about how nice the cabin we were staying in was, the owner said, "I'll build you one, if you like. I can get land for you for almost nothing up here!" The other thing we talked of was linen. Traditionally, as the scrapbook tells us, flax was grown and processed in the village. The artefacts on the wall show us it was spun into thread and the picture of the loom tells us it was woven too. The lady spinning flax is the restaurant owner's mother but the photo was taken years ago. No one plants flax now. That lady was the last to do so and she hasn't planted for two years now. It's back breaking work and she is too old to undertake it. So what is left of this traditional craft? 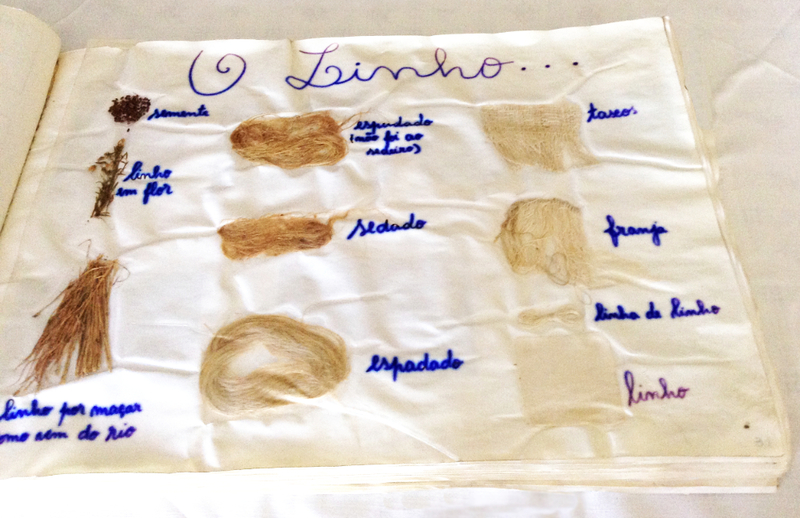 Woven articles in homes, artefacts on a restaurant wall and a story in a children's scrapbook. 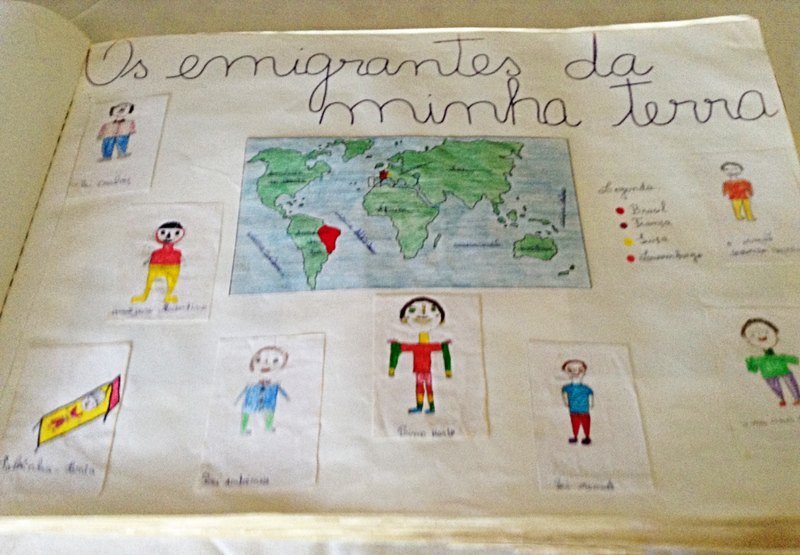 Migration, which concerns us all so much today, isn't new, it just has different causes from the ones which drove the Portuguese from their homes in the second half of the 20th century and continue to do so today. On the plane to the UK recently, we spoke to a middle-aged Portuguese woman, all alone and with rudimentary English. She was on her way to Leeds for a four-day course costing the - for her – gigantic sum of £700. She was hoping to become a care-worker. Her husband had left her and, there being no way she could make a living for herself and their children in Aveiro, the grandparents were taking on her task of looking after the family while, in mid-December, she ventured north to a cold, damp, misty, foreign city in the hope of a better life. We gave her our names and telephone number in case that training company, found on the net, proved unreliable. We have heard nothing over Christmas, which she will have spent alone. I hope she is all right. And so back to the story of the scrapbook. This tale isn't mine. 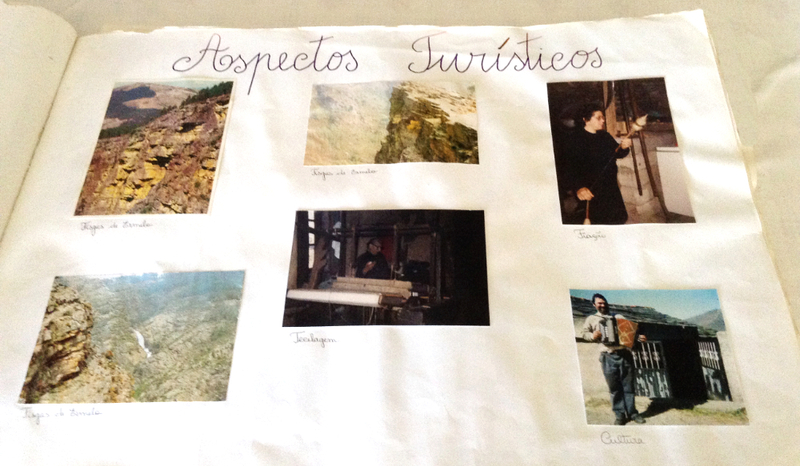 It belongs to the children, now the adults, of the Serra de Alvão, who, as many make new lives overseas, may only be names in a book and in the memories of the old. Would you like, if only fleetingly and at arms length, to meet those who told this story? 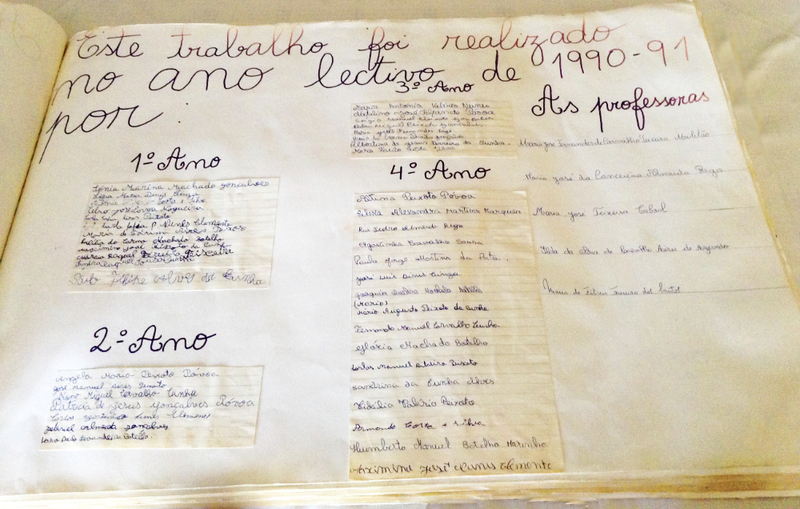 The title of the page below says, "This work was carried out during the academic year 1990-91 by: " and below, year group by year group, the children signed in their own handwriting and added the names of their teachers.